An intensive, creamy butter offering up to 24 hours moisturisation. It absorbs into the skin easily, helping to condition, soften and smooth the skin. Once you get over the indulgent tropical scent, slick this on and be transported all over again. Containing Community Trade shea and cocoa butter. Aqua (Water) (Solvent/Diluent), Caprylic/Capric Triglyceride (Emollient), Cyclomethicone (Emollient), Butyrospermum parkii (Shea Butter) (Emollient), Glycerin (Humectant), Theobroma cacao (Cocoa Butter) (Emollient), Glyceryl Stearate (Emulsifier), PEG-100 Stearate (Surfactant), Cetearyl Alcohol (Emulsifier), Lanolin Alcohol (Stabiliser/Emollient), Phenoxyethanol (Preservative), Parfum (Fragrance), Methylparaben (Preservative), Propylparaben (Preservative), Xanthan Gum (Viscosity Modifier), Benzyl Alcohol (Preservative), Disodium EDTA (Chelating Agent), Benzyl Benzoate (Solvent), Coumarin (Fragrance Ingredient), Butylphenyl Methylpropional (Fragrance Ingredient), Sodium Hydroxide (pH Adjuster), Caramel (Colour). 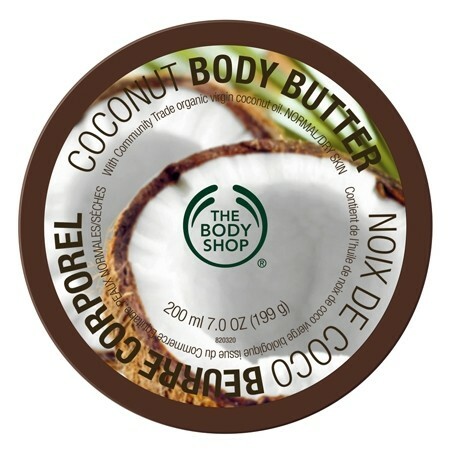 I love the texture of the Body Shop body butters! They are so easy to use the fragrances are gorgeous and addictive! This butter has a thick consistency and is white in colour. It comes in a big brown plastic pot with twist off lid and natural graphics! As with all body butters I find this product easier to apply if I warm the butter between my palms first to aid even and quick absorption. If you do not do this you tend to concentrate the cream in one area meaning you use your product quicker. The fragrance is gorgeous! It is a little sweet and synthetic and not what I would class as a natural coconut smell but I absolutely love it! I do prefer to use this butter at night though as the scent could clash with your fragrance if combined. The moisturisation lasts for hours and your skin feels soft, hydrated, and supple with a delicate sheen. SMELL is amazing, texture is lovely and silky which leaves a nice glow on skin. Absorbs well. I really do love this moisturiser, I've been using it for years and it's a must in my holiday bag. Everybody always comments on the smell and the moisture lasted a while! 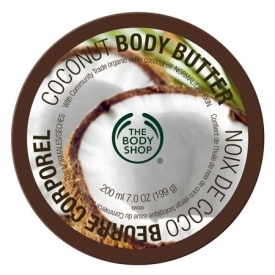 "I love the texture of the Body Shop body butters! They are so easy to use the fragrances are gorgeous and addictive! This butter has..."